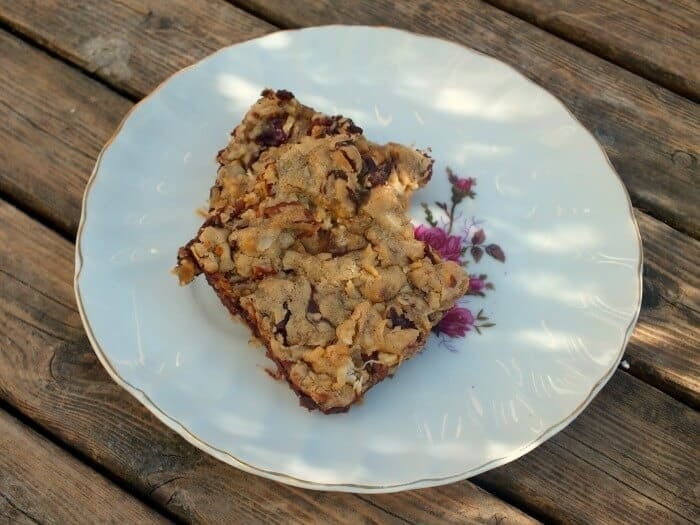 A coconut dried cranberry blondie bars recipe, with chocolate of course, is so easy that you can make it while you’re fixing the kids’ school lunches. How do I know this? Since we have been having such cold weather I’ve been sending the kids soups for lunch. They go to a very small charter school that handles preschool through 12th grade. It was the perfect choice for us after homeschooling since the classes are small and my husband and I have a lot of interaction with the teachers. Anyway, the school has a couple of different buildings and the kids have got to move between them. The cafeteria is in another building so I figure that something hot is going to taste amazing. This morning was a little different. Last week I spent 12 and more hours a day working to finish a 30k word eBook for a client. My body doesn’t handle being pushed past a certain point and so this week I have been sick with viral tonsillitis – I have a hard time staying awake, feeling horrible, etc. So for two weeks I have not cooked much and nothing special. This morning I was determined they’d get a treat of some sort so while I was putting their lunches together I played around with my favorite blondie bars recipe. Coconut Cranberry Blondie Bars have everything you want. Rich pecans give texture and add a nutty sweetness, coconut adds a sweet tropical flavor, the cranberries add chewiness and a tartness, and chocolate — chocolate adds chocolate of course. There is only just enough batter to hold it together in chewy bars. The biggest secret to both blondies and brownies is simply don’t overcook them. Keep in mind that they will firm up as they cool. If you want to serve them warm it’s actually better to warm them back up after they’ve had a chance to cool and you’ve cut them. 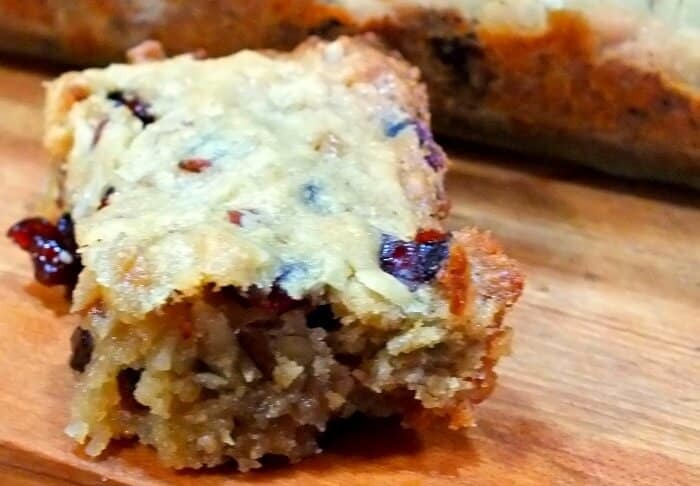 Give these Coconut Cranberry Blondie Bars a shot this weekend. I think you’ll like them. On the off chance you don’t like coconut just leave it out. You can add an extra half cup or so of pecans and cranberries if you want to make up the difference. 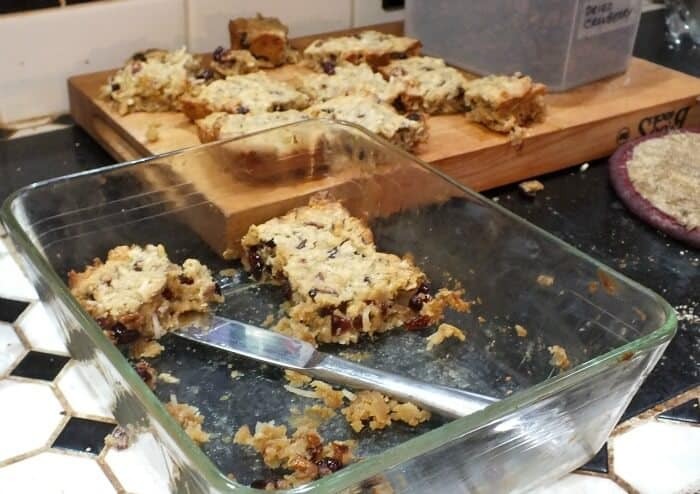 Some people have commented that the bars are too sweet or need baking powder/didn’t bake right… If you don’t like a sweet dessert then feel free to cut the sugar by 1/3 to 1/4 cup. I like the intense sweetness with pockets of the tangy cranberries. It’s a nice contrast. I baked them again exactly as written and they came out fine. You do have to let them cool before cutting as they finish baking in the first few minutes out of the oven. They are dense and chewy not cakey at all. I found this morning that they were not done enough for my taste at the 15 minute mark so I pushed it to 20 minutes as per the recipe. This is the dough. It is very thick and doughy – like drop cookie dough. If yours doesn’t look like this add a little more flour. I press the dough in the greased 8×8 or 9×9 pan. Cranberry bars after 20 minutes in the oven. Let them cool. Be sure to let them cool before cutting. You may even want to refrigerate them. These were cut after 15 minutes of cooling. Here is a closeup of the bars… still warm… dense and chewy. No baking powder. No baking soda. 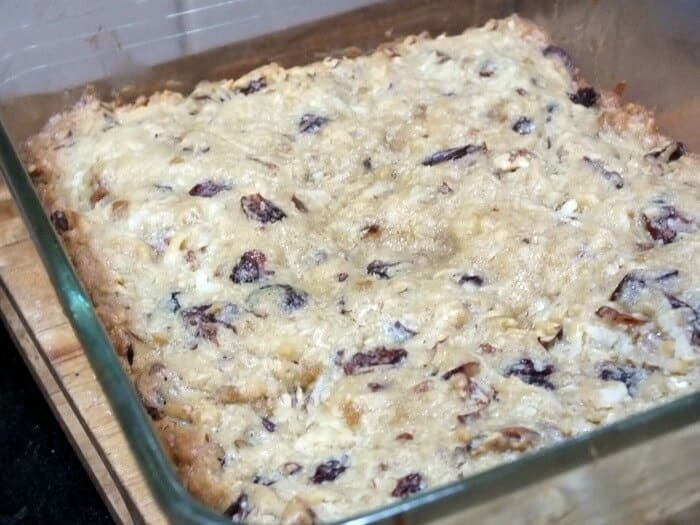 Sweet, nutty bars with coconut, dried cranberries, pecans, and chocolate are perfect in a school lunch or as an afternoon snack. Grease an 8 x 8-inch baking pan. Now, whisk in the egg and vanilla. 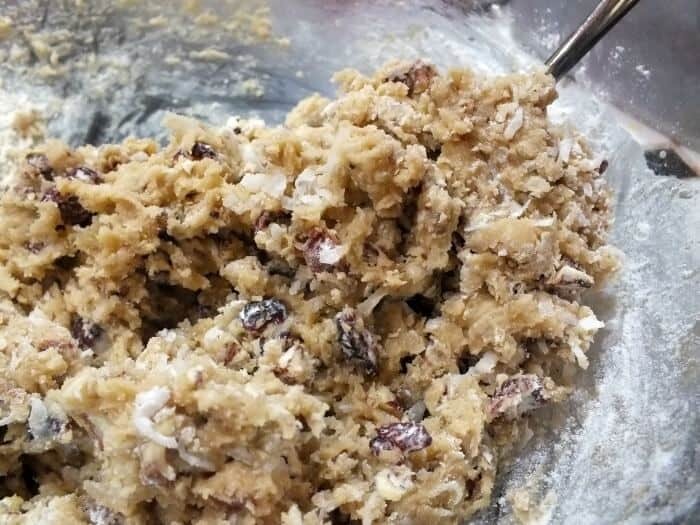 Stir in the flour, coconut, chocolate chips, cranberries, and pecans. The mixture is going to be thick. Spoon it into the prepared pan. You’ll also find more cookie recipes in my cookbook. Published in 2009, it’s available in both hardcopy and Kindle forms. Same problem as mentioned. Baked for 30 minutes and still gooey. I think it needs some baking powder. I made these again this morning. As written. I baked them for 15 minutes, decided they needed a little longer and left them in 5 minutes more. I cooled them for 15 minutes before cutting. These are chewy and dense – they are supposed to be. As for being too sweet? Well, we like them this way. If you don’t like sweet you can cut the sugar by 1/4 cup or a little more.. but for the record the recipe works as written. Would not make these again. Very disappointing. They need baking powder and/or baking soda. I had to bake twice as long and they were still too dense and didn’t cook evenly. Also way too sweet which I rarely claim. I am sorry they didn’t work for you. I promise, there is no baking powder or baking soda in the recipe. Does this need baking powder? Did you forget that? Not rising and not cooking through. Totally bummed! No I didn’t use baking powder. You may need to cook them a bit longer. 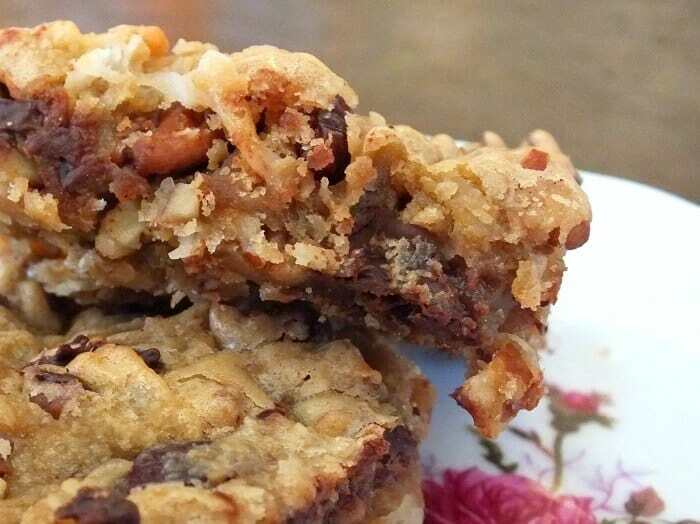 They don’t rise much because they are full of the nuts, coconut, and dried fruit.